We often read in the news about people who have stolen money from the business they work for but we never hear about people who steal time from their employer. I’m always amazed about how much productivity is lost to employees using work time for other things. Take for example the following. Dave bought a machine that came with 5 days of training. To me that meant someone would be there at 8 to train the engineer until 5. These are our working hours. Our staff get 2 fifteen minute tea breaks and a half hour for lunch. The technician arrived at 9 and took a smoke break straight away. Followed by tea at 10 with the staff, and another smoke break. Before lunch at 12 he had another smoke break. By the time 4pm came (when he left) he had probably had 8 cigarettes. At 10 minutes per break it meant his productivity hours were cut by 80 minutes. Taking the 2 hours off his time at us, he was being paid over 3 hours more than he worked. In a normal working week he basically takes a day off to smoke. In another example there is a company which allows an hour for lunch. One staff member has breakfast at work when she arrives at 8, the time she is meant to start working. She has a coffee break mid morning, eats lunch at work and then takes her hour lunch break. She probably spends an hour a day not working by having her meals at work. That equates to half a day of paid time per week. This to me is theft! If you are short of time, and want to bake bread, soda bread is the way to go. There is no yeast and therefore no proving time is needed. You make some really valid points!!! So much of this kind of ‘theft’ happens in offices especially. Then there is the theft of time from and employer that I always had working hospitality 😉 Thanks for this soda bread recipe – I make no knead bread every other day so this might get a run this winter for something to whip up with some soup….I can hardly wait!! Have a great trip, very jealous!!! I always meant to try to make my own, but never got a chance. 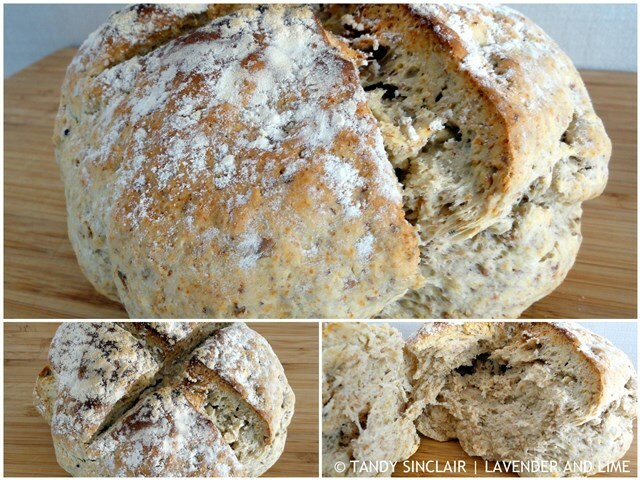 Soda breads is one of my favorite, love the recipe. This bread is just perfect. I love it. I have to send this recipe to my mom, she makes bread, as I will not lol. Have a wonderful trip Tandy :). Enjoy yourself and have a great time. Hopefully she makes the load for you Kay! I love freshly baked soda bread. I’ve never been able to time waste that much mainly because I have had so much work to do! This was always a standby for my mother when I was growing up – living out in the country soda bread and scones were regular baked goods. I love making soda bread, it’s so quick compared to other breads and so good fresh from the oven! I’ve never made soda bread before – it looks tasty. simply damn delicious for starting a day…. I like the idea of baking bread without yeast! The soda bread recipe looks deliciously easy! And oh, I do agree re: productivity, Tandy… it actually struck me when I was in Japan recently, that there is no one mingling outside of office buildings during working hours – no coffee breaks, smoking breaks, running errands etc (things I’ve been guilty of myself at some point, I’m sure) – everyone is focused on their work 9-5 and then leaves promptly on the dot! That would drive me crazy!!! At my job I have no set hours, but I often work well longer than what is expected. This soda bread looks fantastic and easy. I was actually watching a show on t.v. the other day about this family eating soda bread, but it gave no recipe! Totally agree about the theft of time. When I use to work at a t.v. station (non-smoker here) the smokers took 15 minute breaks every hour or two and got to stand outside and enjoy the fresh air (well, as fresh as smokey air can be). But if I just went outside for a few minutes to enjoy the sun, it would have been considered stealing. So odd! Weird that taking a sun break is worse than taking a smoke break! Great! I’ve never tried this kind of bread! Sounds delicious! I wish you a wonderful week, dear!